When you read about WordPress 5 and Gutenberg you will most likely come across some criticism. In a way, the openness of WordPress backfires here. Everybody can complain up front so the buzz is overwhelmingly depressing. In contrast, top-down platforms like Facebook introduce interface changes with no prior public involvement. The outcry follows after it’s too late and there is no way to influence it other than protest. Sure, with Gutenberg there are still bugs, many issues with accessibility (it means people with poor eyesight or other special needs can’t use it yet), or it may cause difficulties with existing sites. It’s easy to overlook the actual advantages, benefits, and new features the new WordPress editor has. Why just dwell on the negative? After all, the bugs will be straightened out over time. Let’s rejoice and take a look why Gutenberg actually makes sense. Otherwise, it would not have been developed at all. Let’s try to ignore all the criticism for a while and just focus on the bright side. That’s not easy these days—not just with WordPress. Pessimism is widespread in general it seems. This article was written by a Gutenberg newbie so it’s also made for mere mortals. Let us know what you think. Have you used Gutenberg already? Just add your feedback in the comment section or on social media! Many posts have been written on what Gutenberg actually is and how it works so we’d skip that here and dive in right into the deep sea. In case you don’t know what we’re talking about, read this intro on Gutenberg first. The New Gutenberg Experience – How Does it Differ? First off what might get overlooked is that you are able to drag and drop text and images on Gutenberg. This is of course fantastic! Images and other elements you’d like to include almost always look strange or out of place once they are in the middle of the body text, so moving them around until they fit this way is a great feature. The possibility to drag and drop will simplify the writing and editing process immensely. There will be no burdensome cut and paste maneuvers once you get used to Gutenberg! Also, you can add images by dropping them onto the post in the first place. That simplifies the task considerably. Not that it was hard until now, but the number of steps becomes even smaller. You can also move content paragraphs by simply clicking top or down arrows. That’s a nifty feature. As a writer, you most probably sometimes have articles that grow from within. What does it mean? As you write, you add more and more insights until a paragraph does not fit in the place it was at the start. Instead of copying and pasting, you can just move it now. It might seem like a little change but when you write a lot you will certainly appreciate that. This feature is also clearly visible so most people will use it from the beginning. Indeed you will miss it on Google Docs once you start using it. You can include social media content from multiple sources now with mere clicks. This is also great news as usually it was too much “either/or” when it comes to publishing something on your site or social media sites. Doing both was too much fuss in many cases. Of course, you could add YouTube videos and the likes for years but this meant copying the actual code and pasting it as HTML, then adding some white space usually. 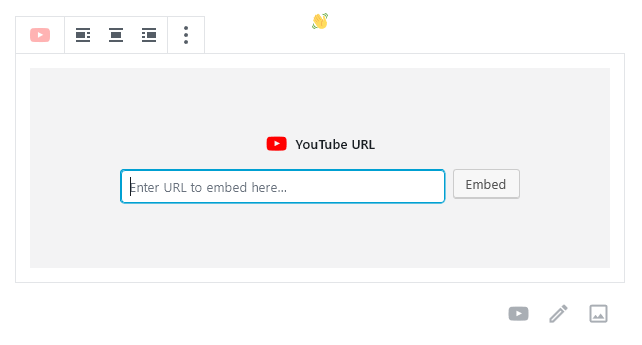 In some cases, you even needed to change the YouTube embed code itself manually. Now you can combine both types of content without much additional hassle. WordPress Gutenberg supports dozens of sites now. Adding updates, images or videoes you or someone else published on third party sites becomes a matter of clicks within the WordPress editor. Copy and paste from office documents works seamlessly now. That was a big pain. You usually needed a third party tool to clean up the messy code software that Microsoft Office or Google Docs would add to the otherwise squeaky clean WordPress HTML. Sometimes it took longer to manually fix that than to write the actual post. A major roadblock for publishing content from one-time contributors (think guest posts) gets removed that way. Some guest bloggers, for example, would add additional colors or text-decoration (think underline or strike-through) to their drafts. These would look weird on the blog so they had to get nixed. These types of abnormal text-formatting disappear automatically now. This is a relief as cleaning up such things was a major annoyance. Copy and paste from websites also becomes easier. 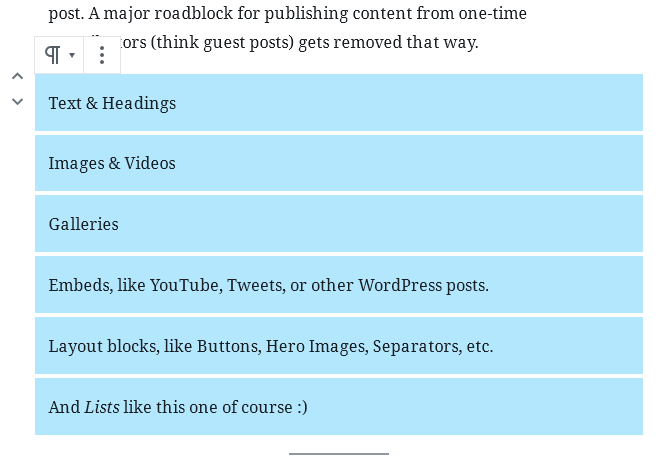 When the original text formatting does not match the rest of your content or is simply redundant you can click “edit as HTML” right in the content block menu (signified by a few vertical dots). You can remove the italics or whatever it is that you don’t want right where you are. While it might sound like just a little change to the past where you would switch the entire editor area to code view it makes that process much faster and less annoying as you don’t have to search all the instances where you’d like to change something. By pressing the “shift” button on your keyboard you can edit more than one paragraph or block at a time. Sometimes you need to delete or format several paragraphs in the same way. In older WordPress versions, it was a bit difficult. You had to select all of them with your mouse and sometimes you couldn’t catch all of them especially when you needed to scroll to get large chunks of body text into your selection. You won’t believe what happened next! One click was sufficient to delete them all at once. There is auto-save for content even when you navigate away during the writing process. This is one of the things that were hugely annoying on WordPress until now. When you navigated away from the old editor you could lose all your recent changes unless you save them. In recent years you had a warning dialog asking you whether you like to go or not but even that one could get accidentally clicked. It’s not as straightforward as on Google Docs for example. In WordPress 4 you had to edit the CSS style each time or for the whole site. In Gutenberg, you only have to add such an element once. You can create a custom “reusable block” and call it text-marker. Then you can add it with just a click how often you want. What’s the Best Gutenberg Feature for You? The things mentioned above are not all of the new Gutenberg features. They are—from a writer and editor perspective—very useful though. Some may even get overlooked at first. In case you use WordPress for e-commerce, as a community platform or for more exotic application, make sure to add your input as well. While we’re at it, remember that there has been a huge load of Gutenberg criticism already on the Web already. We want to focus on what’s new and useful here. Don’t throw the baby out with the bathwater! When you find bugs or have feature requests, please help the WordPress developers directly and provide feedback to the Gutenberg team. If you started using WordPress in the early days you will realize that even though the interface has been improved over the years it has stayed the same by and large. While “never touch a running system” is an idiom that still rings true over time, some tools can become obsolete. Gutenberg makes the user experience future proof and allows WordPress to compete with all the “what you see is what you get” tools. Now the backend of the software can become clean, modern and simple as a whole. The old clunky editor did not really allow that. While criticizing the Gutenberg engineers, always remember that the alternative to Gutenberg is Zuckerberg—Facebook and other walled gardens. WordPress can’t stay the same forever. It has to evolve to adapt to market demands and incorporate technologies that facilitate progress. Ironically some of them can be even a spinoff of walled gardens but WordPress can use them for good. Not sure whether Gutenberg and WordPress 5 is for you? You don’t want to break your site? You can test run it on EasyWP if you want. You can even set up a dummy subdomain and play around with it. It’s just a Dollar for a start. When will WordPress 5 be included in Softilious install. Will Namecheap follow other IP and wait for a stabler release? For our shared hosting customers, WordPress 5.0 has been available through Softaculous in cPanel since Dec. 7th. For EasyWP customers, if you’re using WordPress 4.9.8 you will not be automatically upgraded to 5.0, and you will need to do manual upgrades. Only new sites will be on 5.0 by default. When can we install WordPress 5.0 through Softaculous? Sorry to hear that the new version isn’t working out for you. While you adjust to the new features, you might try installing the Classic Editor plugin, https://wordpress.org/plugins/classic-editor/ . That should give you the benefits of running the newest version of WordPress while still being able to edit your content the way you’re used to. Gutenberg is a huge step back from the idea that there should be a clear separation between CONTENT (WP editor) and LAYOUT/DESIGN (Theme or Page builder plugin). The post or page should not be DESIGNED on the front end. That’s what templates should do automatically…for instance post templates created in third party page builder plugins that will transform the content entered in the WP editor into LAYOUT and DESIGN determined by those templates. Only special posts should be designed on the front perhaps. Freakimg Awesome features, however, some older features are missing. I agree that most of the design should be on the template side of things, and I believe that still is the case. But the exceptions are many, and if you want to have rich content you have to “design” it as you write it. Unless your post is 100% text with no bold, italic, quotes, images, videos, anything, it’s much easier to be working in an editor that helps show you the layout of things. Gutenberg should have been left as an option only not a core decision. Sure there’s the classic editor plugin but now we’re forced to add yet another plugin to get back the editor that should have never been removed. It’s a massive punch to the gut for those who have relied on and trusted WordPress to remain lean and customizable for many many years. They have completely gone against their own philosophy with this decision. Gutenberg really really really helped me in having columns for the bilingual site that I run for a parish. since the site is information heavy, the text needed to be formatted to be easy to read. It also plays nice with the images of the site. None of the templates had this flexibility, and now I can focus on designing the content to fit, rather than struggling to wrangle a template to do columns. Seriously great step for my use case of a bilingual website.